What a great night of sleep! I have slept well every night but not necessarily for very long but last night I got a full night of sleep. Maybe it was the long day of travel to Battambang, whatever the cause I felt so rested. So we grabbed a rather large breakfast and headed out with Mr. Mony to the bamboo train. They are essentially wooden frames with bamboo platforms on top with an engine and two axels that are used to travel up and down the rail lines. The beauty is that they are modular thus allowing them to be quickly taken apart and moved off the track when trains approach. These days I don't think that there are any trains using these old sections of the railroad tracks and it is mostly a tourist trap but it does take you to a rather neat village where they make bricks. I didn't know that they take clay and put it thought a Play-Doh press and then cut them to size before firing in these massive domed ovens with hobbit-sized doors. After our rail adventure we took off for Wat Ek Phnom. It is an 11th century temple that is mostly in ruins with a much newer and more modern counterpart in front. There were a few other people visiting the site while we were there but it was nice to see that they still use the altar in the old temple. The sun was getting hot so we decided to find some lunch and then head back to our hotel for a little bit of rest before heading out again. Francene, Araceli and I decided to take a dip in the pool that dominates the common area between our bungalows. As expected the water was a little too warm to be considered refreshing but it was nice nonetheless. For the afternoon we wanted to go the youth circus at the Phare Ponleu Selpak School. They practice daily and have performances three nights a week. Unfortunately because of the passing of the father-king there were religious services being conducted and there was no school or performance. I guess our timing was just off but there were some kids playing outside and they we all eager to show off for us and got really excited when we started taking their pictures. By our best guess the kids were probably between five and eight years old but these kids were tough. They climbed on each other's shoulders and then moved to stand, they saluted, the cartwheeled, and they wrestled all to get our attention. It was really fun to see them so excited. Sadly some of these children were homeless, living on the street before being taken in by the school but now they're getting an education, learning valuable skills and hopefully they will all be able to find gainful employment when they finish. It was hot and we had been out a lot today so Brian and Nicole wanted to return to the hotel for some much needed and deserved rest. On the way Mr. Mony saw a woman selling snacks on the side of the road and asked if we were hungry. Not sure what he was referring to we said we would be happy to stop; we like adventure. What we found was a cart laden with all kinds of tasty treats from water beetles to snakes. The were mounds and mounds of crickets and grasshoppers, frogs sorted by size, rats, shrimp and even peanuts! Once Brian and Nicole were back in the cool sanctuary of the hotel Francene, Araceli, and I decided we still had some energy. Before going out to dinner we were driven out into the country to watch the sunset. It was amazing. There were nice clouds, bright colors and wide open skies above the rice paddies. 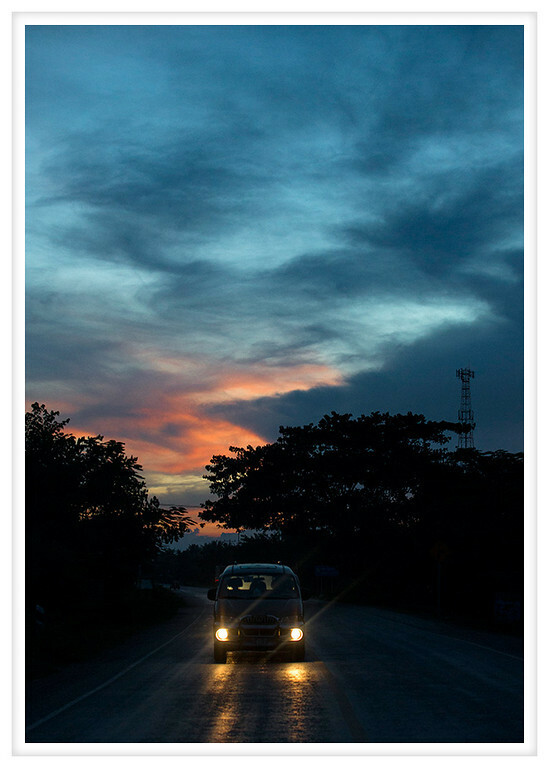 As we returned to Battambang the sun sank lower and when we arrived at our dinner spot it had set completely. We ate at the White Rose on the second story balcony overlooking the street. It was a nice meal of traditional Khmer dishes and lovely tropical fruit shakes. When we finished eating we tried to get our tuk tuk driver from last night to pick us up but he was already engaged so it was decided that we could use a nice walk back. The night was still warm and the city was active as we wandered to our hotel. It didn't take too long but I think we were all sweating by the time we got back to our rooms. Oh well, it was good to work off a little bit of the massive meal we had just devoured. Full and happy it was time for bed!